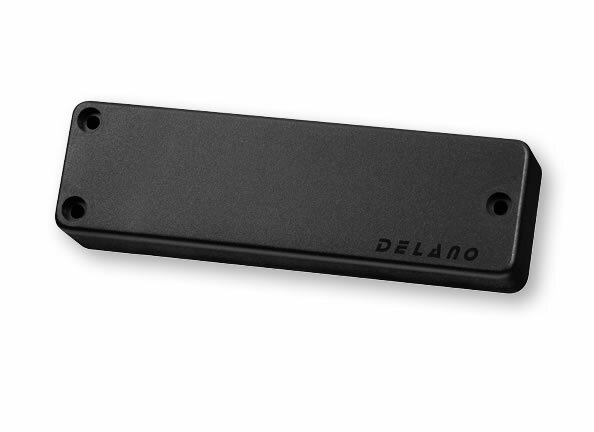 DELANO SBC series bass pickups are dual or quad-coil electric bass humbuckers in the classic bass soapbar shapes, available for four, five, six and seven-string basses. They represent the leading edge in dedicated bass transducer technology. Unbelievably full and open sound throughout the entire spectrum with tight bottom, airy midrange and heavenly harmonics unrivalled by ANY other bass pickup. Finally your bass CAN sound like it should. Available as individual units or in perfectly matched pairs. Our SBC 5 HE/S-4 quad coil 5-string bass transducer is a serious multi-tonality monster. The same big dimensional 5-string sound our standard SBC 5 HE/S pickups are famous for, and many useful humfree tones on top through additional wiring and coil sensing options. Great P-cross coil impersonations with zero 50/60 cycle headaches on top of our perfectly voiced, airy sounding dual coil modes. Options that make sense for players with big ears who know what they want from a highend bass transducer that´s just made to deliver. If this bass could only hear.- with DELANO, it can even tell.